A week ago my friend and blog partner Karen met for lunch and a trip to our favorite book store, Cover to Cover in Columbus, Ohio. As always the book discussions with Sally and Beth were informative and fun. All 4 of us agree that the Newbery folks will have their work cut out for them this year. It seems like every new book I read I add to my list of Newbery hopefuls, and the most recent, The Lions of Little Rock by Kristin Levine is no exception. The story takes place in 1958, one year after the familiar story of the Little Rock 9. 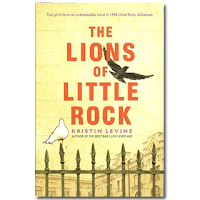 Most of us know the story of the nine heroic African American students who broke the color barrier of Central High School in Little Rock, Arkansas, but author Kristin Levine decided to use the following year for her story setting. What a brilliant idea, there is a whole new tone to the city of Little Rock, and the tension makes for a great backdrop for a dramatic story. In 1958 the school board voted to close the Little Rock high schools to avoid "race mixing" as it was described. For the family of Marlee Nisbitt the school board could not have made a more impactful decision. Marlee is in junior high, so she will attend school, her older sister Judy attends one of the high schools so her dreams of college could be on hold as she enters her senior year. Mr. and Mrs. Nesbitt both teach at the high schools so they will be going to work, but there won't be any students to teach. Not only is the family schedule impacted by the decision, but their reactions to it are just as mixed up. They are torn on their beliefs about what is the right thing to do. Marlee, the main character of the story, gets thrown into the middle of it when her new friend Liz just stops coming to school one day under some very mysterious circumstances. In addition to being in the middle of the beginnings of the Civil Rights movement, Marlee is also on the cutting edge of the space race and the role of girls when it came to studying math and science. Marlee is a sort of selective mute. She is able to speak and does in comfortable situations, but talking to people she doesn't know or in front of the class is difficult for her. The one place she feels a bit comfortable is in math class, where she excels. Fortunately for her, the new math teacher is an encouraging young man who has no stereotypes when it comes to numbers, he just sees skill and intelligence, not gender. He encourages Marlee's love of numbers even working with her at lunch when she's uncomfortable in the cafeteria, to study algebra. Through all of these historical events and changes in our country, author Kristin Levine creates some incredibly memorable characters. Of course Marlee is the heroine of the story. From the beginning when she is afraid to go off of the high dive, to the end where she stands up in the face of adversity the reader can't help but cheer for her. Marlee is strong and inspiring. Liz, the new girl at school, who is there one day and gone the next helps Marlee come out of her shell and understand her own strength. In the face of horrible adversity, Liz works with Marlee and encourages her to speak in front of the class for a class project. It also helps Marlee stand up to her "friend" Sally, a girl bully and Red, the son of a racist town leader. Liz is in a tough spot, caught between two worlds and it puts her in a dangerous place. Through it all, she and Marlee remain friends, meeting secretly, writing letters and talking on the phone. Together they become more than either would have become on their own. 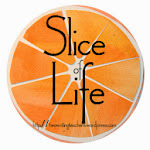 I'm adding The Lions of Little Rock to my Newbery list that also includes The One and Only Ivan, Wonder, The Mighty Miss Malone and Three Times Lucky. Hopefully my luck continues reading the 2012 titles. Thanks for another great title! I am caught up with your Newbery watch list so now I am headed off to the library to request this new title. This is one of my favorite summer reads....a really exceptional book.